Despite the rainy, windy weather….I grabbed my umbrella and went for a walk. I find much inspiration on rainy days, especially rainy fall days. 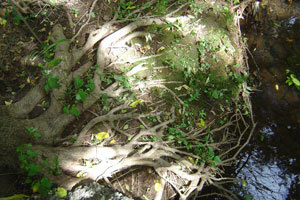 Roots and water. A magical little oasis. Sunny spots. 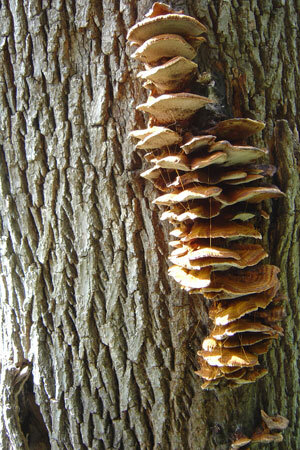 Look at these mushrooms! I love all the texture. Some spider had a blast “webbing” this. I didn’t find a faerie ring…but I created one in my new quilt. Stitched detail. 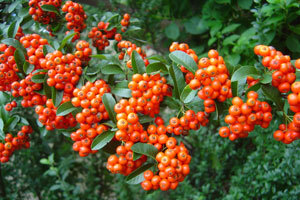 These autumn berries were SO BRIGHT in the sunlight, which peaked out…finally! 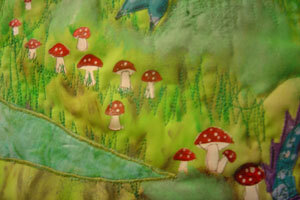 Here’s a little teaser of my new quilt commission. I’m going to call this one “The Royal Faerie Ring”. A ring of little red and white spotty mushrooms surrounds a faerie princess and her dragon love. A finished picture coming very soon. Ooooo… and Faerie Magazine says “send us your faerie fiber art” so you KNOW where these pictures are going to be sent next week!! I would love to learn how to do this one day. I covered two corset belts with leaves. 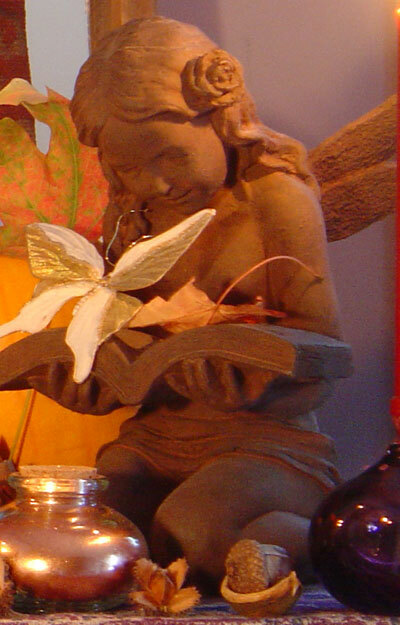 One for a fall faerie outfit. Lace-up clothing is pretty…uncomfortable. 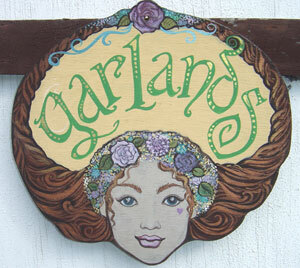 I graduated from here, majoring in fashion illustration and toy design. I miss. Reading lots on this subject. 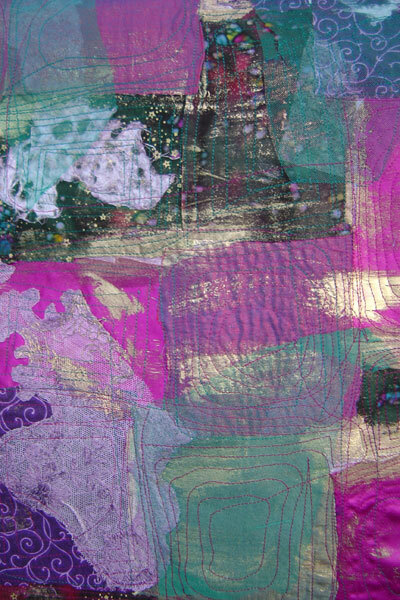 Layers of fabrics and paint adorn my quilts. I dress in many layers when it gets chilly. Fuzzy wool sweaters over soft vintage shirts. Knee sock and tall boots. La la la layers. Love layers. Moonstone is my favorite. I have a huge moonstone ring, and a pretty necklace. And I like amber too. Red amber rocks. I have a big piece of amethyst that I bought at a yard sale for 50 cents. Of old things- lace, clothing, buttons…tid bits of this and that. I’ve got lots of it stashed in my studio, waiting for me. Soft, shimmery and fun to paint on and wear! I’m in the process of making a silk wallhanging. There was a full moon the other night. Pretty. Check out We’Moon. I was hooked, now my yoganess is kaput. I know I need to go. 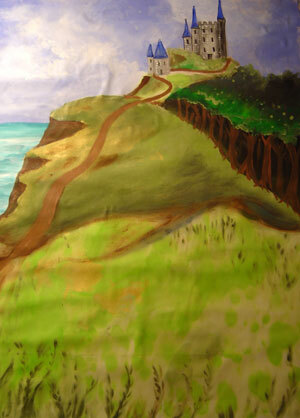 A peek at a background for a wall hanging commission I’m working on. There’s many layers of paint, fabric and embellishments over this base textile painting, and I will post pictures very soon. The figures in this will be a dragon and a princess. You’ll see! 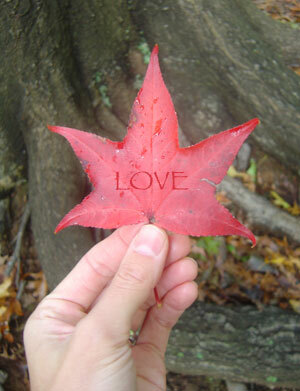 I walk through the park, picking up this and that…inspirational little autumn treasures. Recently my abalone shell is OVERFLOWING with fall goodness. And just yesterday I bought a new, GIGANTIC one at the thrift shop. A lucky find. (The one in the picture is still my small one). 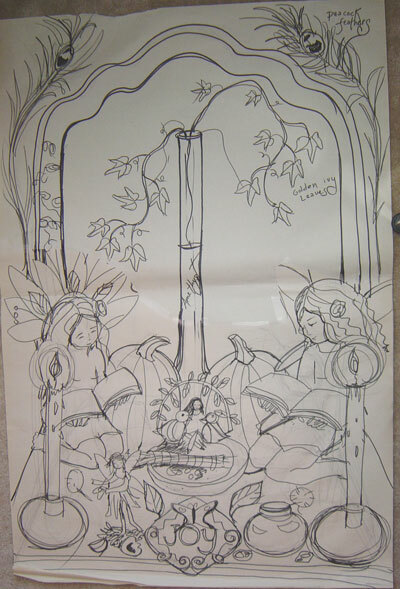 Heres an extremely sketchy and rough layout of the alter wall hanging. I just wanted to establish relationships and whereabouts of the objects. It was fun, and I love this step! 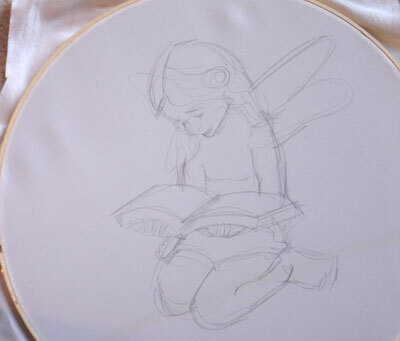 I draw directly on the stretched silk in pencil, looking at the fae statue for reference. And here she is- my model! I am going to put this aside and work on a very “royal” textile piece right now. Ohhhhh, its going to be lovely! Peacock feather surface design finished! This piece turned out to be just SO dimensional! 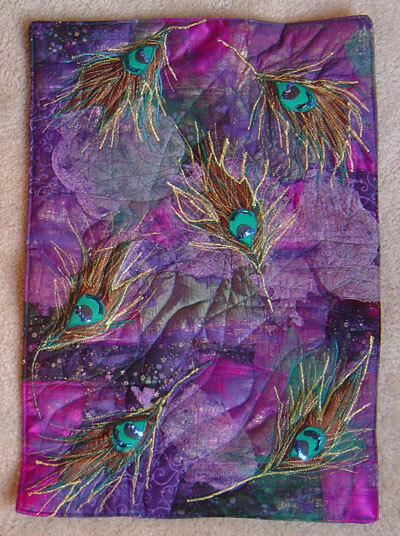 On top of using the quilt batting, I stuffed each peacock feather with fluff to make it pop, then stitched like crazy with golden thread. Topped it off with green sparkle beads and sequins. Here it is- 13 1/2″ by 19″. From this piece I have a whole bunch of new ideas. I’m going to create a few more peacock pieces inspired by this initial wall hanging, but they are going to all be quite different (hint- they include the female figure and some other surprises). This new way of working is very exciting…it gets me thinking about series and such. AND I get to PLAY with the fabric without a sketch!!! I bought peacock feathers to use as reference. Before I embroidered and appliqued the peacock feathers on, I started with this base fabric. I made it by fusing together antique lace, satins, cottons and tulle. Layered it with paint too. I free motion stitched all over it in square spirals. So, basically, this is what it looks like UNDER the stuffed feathers. 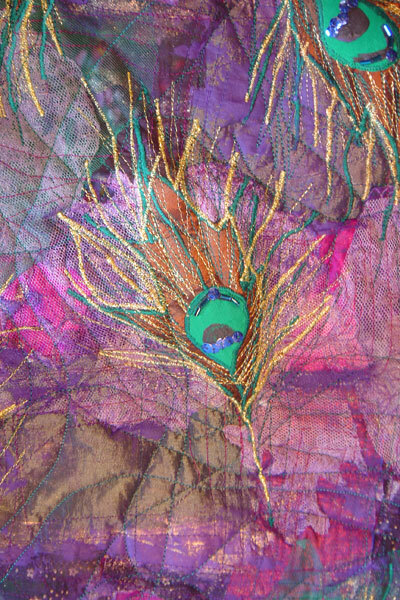 heres a detail picture of a feather…if you look closely you can see tulle, lace, etc pressed in there. 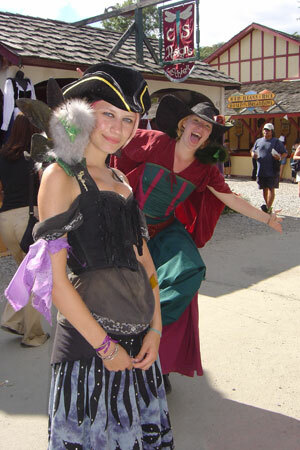 I went to the NY Ren Faire and I took a few pics, mainly things (not people) for their texture. 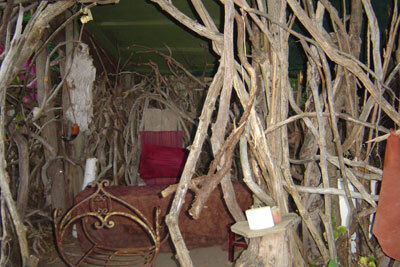 My favorite is this gypsy grotto made entirely of sticks. Just look at those velvet pillows and rusty wrought iron furniture! 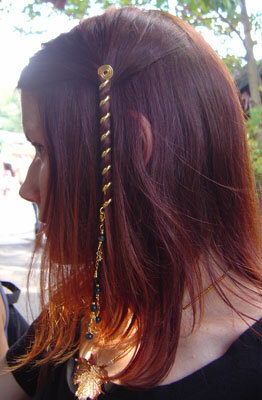 They were selling this hair at a booth at the faire. I love the colors. 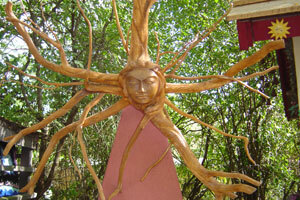 Look at this woman carved into a twisty tree branch! I think she was for sale. 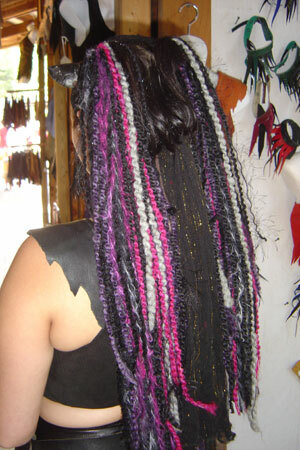 Her hair reminds me of beautiful dreads. 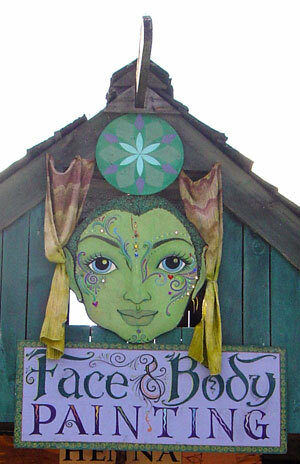 The theme here must be hair- but this sign was too cute. I always want to buy one of these garlands (made of dried flowers and ribbon) but my crown is always occupied with other goodies. Like this twisty thing I bought for MY hair. I love it! 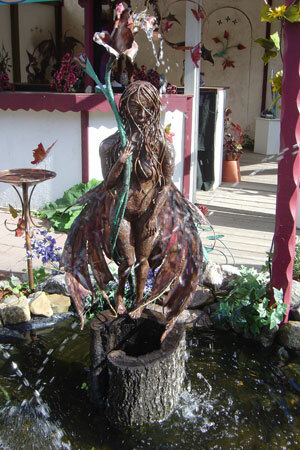 And finally, heres a really pretty copper (I think) fountain of a faerie. I love the hair here as well! This piece is so textured! I wanted to manipulate the fabric, add dimension. 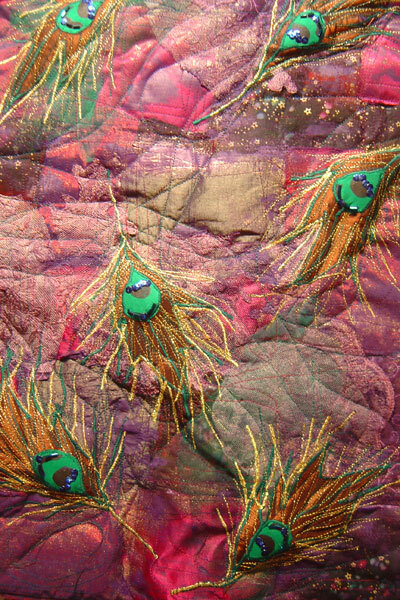 Antique lace, silks, satins, batiks, paint, beads, sequins and thread… all layered, fused, sewn, layered. Right now I’m inspired by natural things that I can hold in my hand, organic shapes and texture, against snippets of fabric and paint. 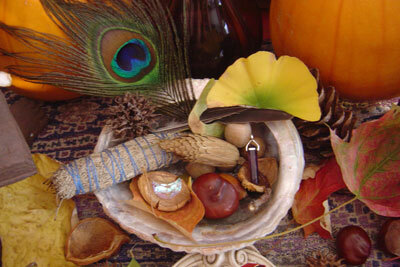 Feathers, leaves, acorns. I’m going to make some wall hangings based on these objects. Free flowing, working directly from life. I may make a pictorial quilt based on this textile design. Perhaps a woman will wear a dress fashioned out of this fabric? Projects, Musings, Updates, Pomegranate Green Tea! 1. 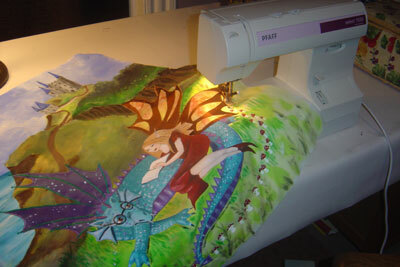 Commissions- I am stitching up a wall hanging fit for a faerie princess ! This creation consists of castles and crowns, a princess, AND a friendly dragon! In cool blues and purples, oh my! Hand painting silk charmeuse ( a lovely fabric, by the way http://www.dharmatrading.com/html/eng/3474-AA.shtml) with steam set dyes and a resist. I have “resist” colors in silver, golden and black. The dyes must be set with steam for one hour plus in order to set them permanently. The dye then “become one” with the silk proteins (as opposed to the paint and other media, which just sits on top of the fabric). The end product is just so translucent and shimmery. http://sarahblankstudios.com/images/quilts/quilt1.jpg. Now I am ready to try some original designs. 4. I bought a plethora of fabulous rayon threads. I never used rayon before. Boy, does it shine and shimmer. It looks so pretty with the silk. Well, back to sipping my pomegranate green tea (it’s just SO yummy!) playing with dyes, and listening to Mirabilis by the Mediaeval Baebes. Please dont mix ’em up, and you MUST hear the new MB music, its wonderful!